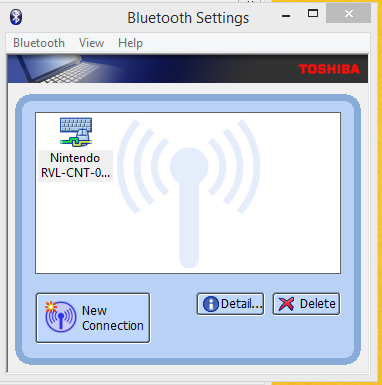 Open the Toshiba Bluetooth Stack and click in New connection. Well, I hope this helps someone, after I tried yesterday almost all day I found a solution. My problem was with the Toshiba Bluetooth stack, I was able to connect the controller and the green and yellow lines were showing but the connection was dropping right after. it won't even last more than 1 second. Just follow this and the Remote will stay connected. 2. Then right after press the sync button on the back of the wii remote and don't do anything else. 3. Then you will see this window, (don't press anything else) Wait until the lights of the controller are OFF and Then click Next. 5. Now press B (yes, B on the back of the Remote) and THAT's ALL, the screen will change and you are going to see the remote connected. 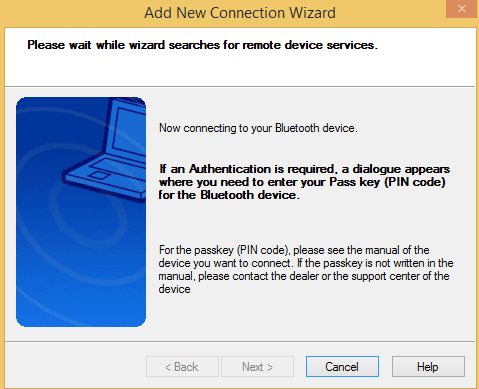 To reconnect, double click on the icon and click OK. NOW PRESS "B: on the remote. That's it, it is re-connected. I hope this helps, I read the entire Toshiba Bleu Stack instructions, a lot o pages on the forums and nowhere mentions to sue the button B on the remote. Apparently the forum's bbcode parser doesn't like data:image/png images. So I've hidden the images in spoiler tags. Can you please replace the images with versions uploaded onto an image hosting site, such as imgur? 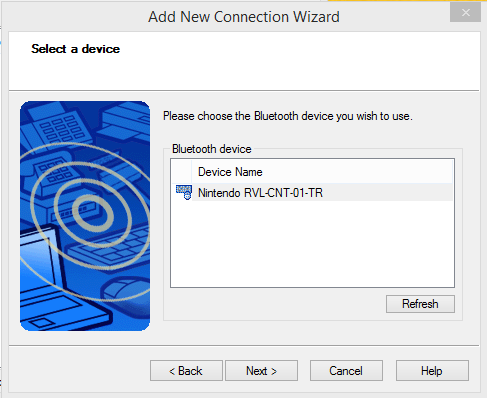 if the wiimote then disconnects again, don't reconnect it physically but use dolphin's hotkeys, if that fails, reconnect it using the above method. This works!!!!! I have been trying to get my wiimote to connect to my pc for 2 days and I was about to give up. Tried this, and worked. Thank you so much!